But hiding it just made it worse. And things began to happen that caused my doubts to grow. First, my pastor asked me to resign from every position at my church because he found out that I was gay. My parents made me go to counseling for the same thing. I went from being the golden boy of my church to barely being greeted. That was the final straw. So I left, I tried other churches, even worked at another, larger Baptist church as part of the media team for their televised services. But the doubts were still there and it felt like God had disappeared. I never quite became agnostic, but for a brief period, I was close. I began to doubt if God loved me or was even there because all the Christians — who were supposed to be his ambassadors here on earth — were hateful and judgmental and fake. How was I supposed to believe in a God who hated me for something that I could not help or change? [Being gay] wasn’t a choice. I never chose it. Why would I choose to ruin my life and make it harder? But through the writings, blogs, and videos of several authors, I began to realize that God was there, welcomed my doubts, cared for and loved me, and was NOTHING like those Christians who claimed to represent him. God is truly love. And that brings me to where I am now. 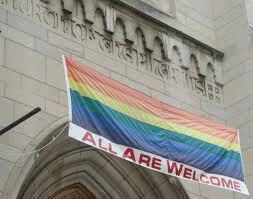 I am a Christian, I love Jesus, I am gay, and I still do go to church every now and again. But I don’t like organized religion, nor do I need it to know God. I don’t feel guilty if I miss a Sunday. And I don’t claim a denomination — or any label really — though I am often labeled by other Christians as “emergent” or “liberal” in my theology. I simply believe that Christ is love and loves everyone as they are, and I, as his follower, should do the same." My second conversion — when I left the church, and when I came out — was completely different. I lost friends and got many a thinly veiled negative reaction. My pastor, of course, asked me to resign. My discipleship partner, who was a strict Calvinist (and lover of pastors like John Piper and Mark Driscoll), stopped meeting with me when I said I was gay and couldn’t change it. He even argued that he had to question whether I was really saved or not. A close friend said she could no longer include me in her circle of close friends because my lifestyle was not one she approved of. My parents first made me go to counseling to be “healed,” but I grew tired of hiding and denying my homosexuality to keep the peace. Eventually they asked me to move out. And although I am still on good, speaking terms with them, it hurt that they would do that to me. Many friends supported and stood by me and loved me for who I was. They were there for me when I needed to cry or vent. Some even convinced their parents to open their homes to me. But I did lose a few. To this day, I still get texts, emails, and Facebook messages and comments telling me to turn back to God and that every bit of bad luck is because He is trying to get my attention. To this day, I still find it’s hard to deal with the fact that people would change or leave me because of a part of who I am. My 6 year old daughter named the bike on Tuesday. First choice: "Sparkles" (not gonna happen). Second choice: "Fire" (bad luck all the way round - Gremlin Bell ain't gonna erase that one). Final selection: "Melody" (she definitely sings like an angel). I'm envisioning a series of contemplative blog posts coming out of these experiences. As I discuss in my book, time alone with God looks very different on different people. My four hours on Melody today are going to be about pondering the direction and intensity of the wind for the most part. But I'm guessing that alot of what I've been researching and developing into a new book proposal will wedge their way into my thoughts at times. Godspeed to you in your time alone this week...make sure you get one. To Terry Jones and the rest of his ilk - Just shut up!